No more yellow headlights – For the fainthearted . . . Approaching yellow headlights at the edge of a small Irish town. 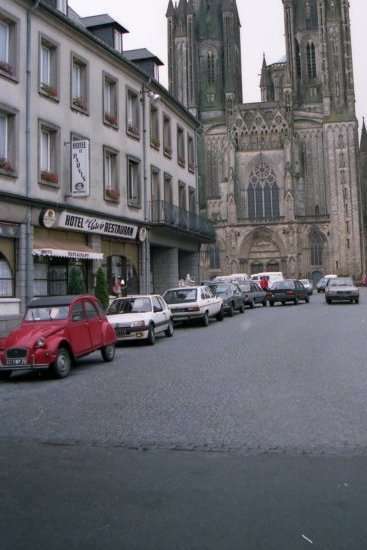 Do you remember the preparations that had to be made for driving in France in the 1980s? The beam blockers that had to be applied to the headlights so that when switched to dip, they did not shine to the left, dazzling traffic the oncoming traffic. Some people would save the cost of the pack by using black masking tape, though it did not come with a piece of paper that had diagrams showing which area of the light should be covered. Once the blockers were applied there was a little bottle of yellow liquid with which to cover the headlamp glass so that the light showed yellow. The liquid came in a little bottle and was painted on with a brush similar to the size of those used for nail varnish. Having yellow headlights put one into a summery mood, and conferred an exotic air. Driving the M6 motorway in England early on an August evening, bound eventually for some French destination, the driver of a lorry on the other carriageway flashed its yellow headlights at us. We could almost pass as foreign. The ’80s marked the end of the requirement for the yellow lights, dull whiteness prevailed, though it could not capture the warm mellowness of August evenings deep in the Midi. 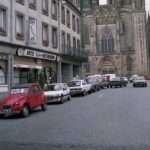 The end of the yellow lights seemed to presage the end of much that was distinctive about France, the little, quirky things that gave one a sense that this was a place that cared not a whit about what others might think, it would do things in its own way. The idiosyncratic telephones, where one dialled “19” and waited for a change in the tone before beginning an international call have gone, the hexagonal boxes remain, but the apparatus is hardly different from that found anywhere else in the world. One hundred franc banknotes with Marianne leading the forces of the 1830 revolution are now collectors’ pieces. Shops stocking only UHT milk are uncommon, country supermarkets having pasteurized options in their refrigerators. Even the toilets, so long the talking point for English visitors, are reassuringly conventional. Of course, a French visitor to Ireland would point to a similar trend here towards international uniformity; distinctiveness becoming something that might meet with the disapproval of those seeking European standardization. The yellow headlights passed. It was nothing more than a 2008 Dublin registered family saloon; a pity, a Citroen with eccentric suspension, or a Renault 4 in its fourth decade, would have been nice.